The HYDR8 Digital Skin Analysis system uses the latest Bio-electric Impedance Analysis (BIA) technology to detect the moisture, oil, and softness of your skin. Hydr8 provides you with an actual reading of your skin to reveal what you cannot see in the mirror to allow you to take a measurable approach to your skin care. Food, beverages, health conditions, lifestyle, seasons and environments will all affect the skin. To have proper skin care products, this measurement tool can enhance your understanding of your skin and help you to use the right daily skincare regimen which can continuously vary due to changing conditions. Simply remove the protective cap and place the end of the analyzer on your skin for 5 seconds, until you hear a beep. The LCD screen will then display an easy to read measurement for moisture, oil and skin type/condition. An easy reference chart is provided both in the manual and on the side of the unit. For best results, ensure the skin surface is free from impurities, like make-up. Use your skin profile ratings, in combination with the skin type instructions provided in the manual, to find the right skincare regimen and adjust as needed. 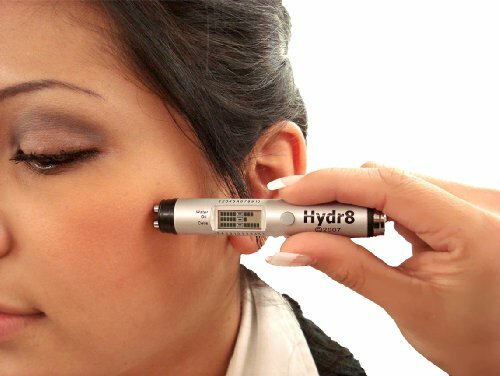 Hydr8 is compact and portable, perfect for everyday use and is suitable for both professional skin care consultation and personal use. Batteries included. If you have any questions about this product by Hydr8, contact us by completing and submitting the form below. If you are looking for a specif part number, please include it with your message.